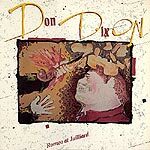 CD review: "Romeo at Juilliard"
Don Dixon's main claim to fame is as producer of R.E.M. 's albums. But with the release of "Romeo at Juilliard," Dixon may begin to garner artistic notice of his own. With a voice like Randy Newman's and catchy pop tunes with a sharp edge, Dixon has an individual sound that is both accessible and challenging. While the sweeping melodies and neat harmonies are on a par with the best Top 40 hits, there is an underlying feeling of cynical humor in Dixon's music. On songs like "Your Sister Told Me," "Million Angels Sigh," "Romeo" and "Borrowed Time," Dixon seems to be poking fun at musicians who take themselves too seriously. The harmonies are a little too tight, the progressions too plastic  and then Dixon tosses in some dissonance or off-beat rhythm and you wonder what he was up to all along.